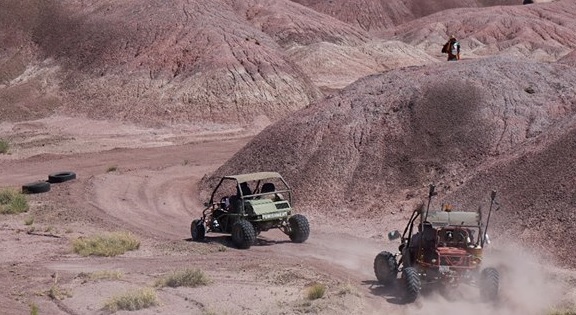 is a themed post-apocalyptic style battle between Drivers in modified off-road go-karts, armed with cheap airsoft guns and various dirty tricks incorporated into their vehicles. The sport has the opportunity for, and highly encourages, on-track and off-track theatrics, but that is where the staged aspect ends; we do not pre-determine a winner, the races are not fixed, and how you win is based on your style of driving and skills. 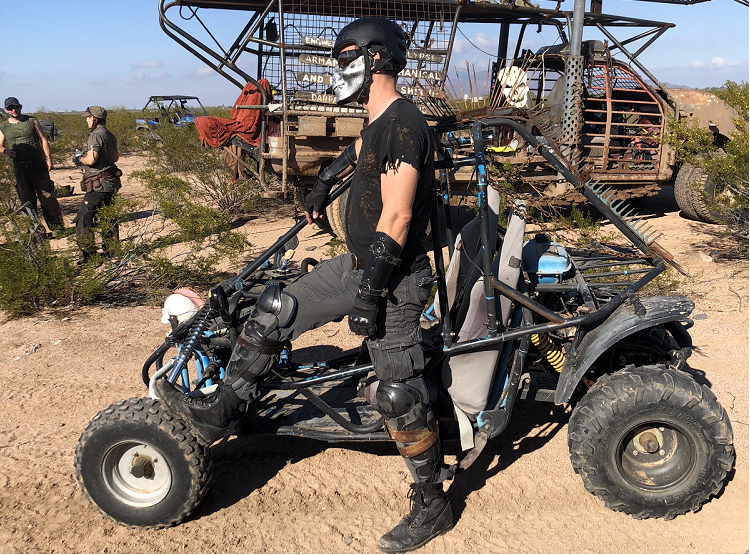 The goal is a good time and getting as close to Mad Max road combat as possible without the risk of life and limb. Our rules list is short and simple to follow, so pay attention. We all know that the only reason rules exist is because someone before you did something messed up and ruined it for everyone. So, follow these rules, and use some common sense, and we can keep our rules list small and easy to follow for years to come. This is dangerous stuff here. By taking part in the races, you take your well being into your own hands. 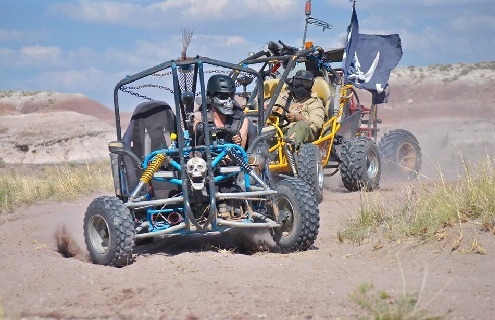 You must pre-register for the Death Rally prior to the EOD scheduled event and complete an online waiver. Forgot to register but brought your cart anyways? Feel free to join in the vehicle parade instead. It’s the wastes. We fully understand that your carts are thrown together with duct-tape, chicken wire, and zip-ties. That said, you must be able to pass an inspection by our safety-inspector prior to race time. This includes leaky fuel lines; fix them before you hit that track or you may be disqualified. Underdog carts are encouraged to enter the race. The biggest/baddest carts are not always the winner. At the current time, mini-bikes are not permitted to participate in the Death Rally, but are encouraged to participate in the vehicle parade. It happens – these things flip. Let’s keep those appendages intact! Safety Third (when you’re not racing)! Weapons are to be used to shoot opponents’ vehicle “armor” only. 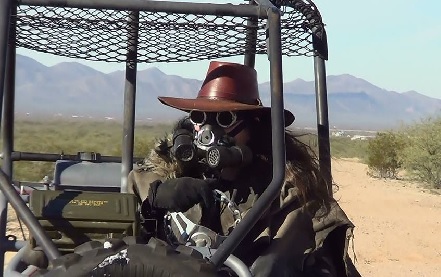 Drivers may wield basic airsoft pistols. Co2 is permitted, but no full-auto and muzzle velocity reasonable (<350 fps). Paintball and other firearms are not permitted. Vehicle weapons must be cosmetic only and not designed to cause any real damage or harm to opposing participants or their vehicles. IMPORTANT! 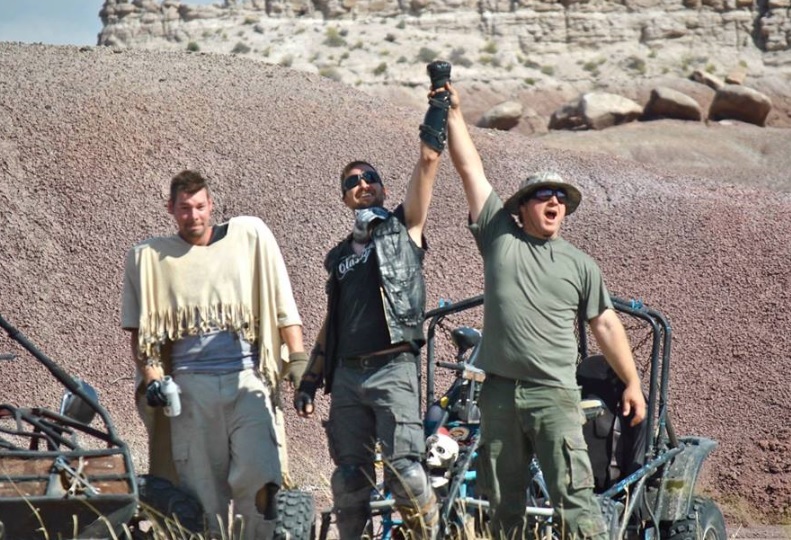 Inappropriate behavior* by a Death Rally participant may result in disqualification and removal from the race.